Up for a tour of Black & Latino-owned wineries in Napa & Sonoma? 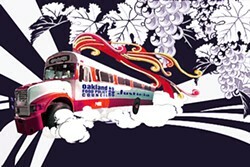 An Oakland-based nonprofit is offering the Wine Soul Train, a daylong tour of Black- and Latino-owned wineries in Napa and Sonoma. The initial tour will take place on Saturday, September 26, with a tour bus that seats 35 people departing from Miss Ollie’s restaurant (901 Washington St., Oakland) at 10 a.m. If the Wine Soul Train is successful, it might become a semi-regular event. Did you know there’s a Napa Sonoma Mexican-American Vintners Association? The vintners association currently has fifteen members, and there are estimates there are another eight to ten Latino-owned wineries in Napa Valley alone — out of a total of about 450 wineries in Napa. That’s a small percentage, but it’s not as though they, and the small handful of Black-owned wineries, are nonexistent. Their lack of visibility, though, is a big part of the motivation for organizing the tour.